This quality level is ensured by the new multi-function turning and grinding machine VLC 200 GT by EMAG. Every detail is specially designed for the machining of gearwheels. All machining operations are performed in rapid succession and in one clamping operation. 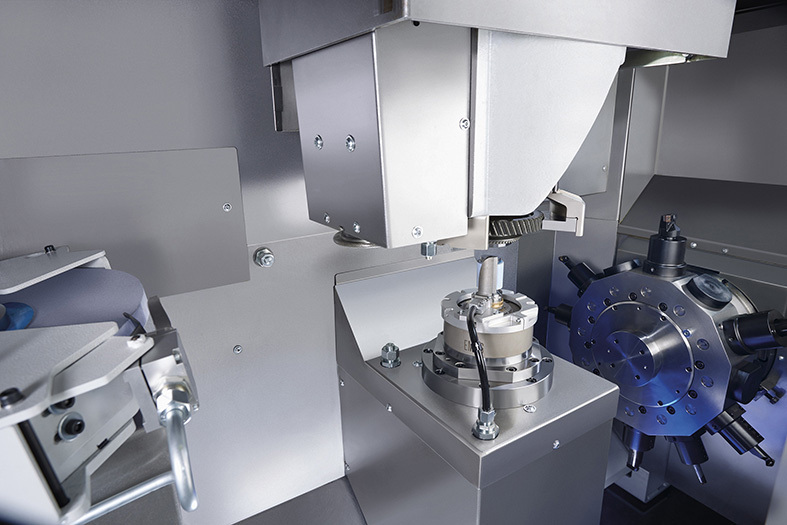 The loading of the machine by pick-up spindle sets the pace for high-speed operation. To minimize non-productive times, EMAG has optimized the mechanism of the machining area door, among others. When the component has reached its machining position, the process starts with hard pre-turning of the shoulder and the bore hole. The following grinding process is particularly fast because only an allowance of a few micrometers needs to be ground away. In addition, tool costs will decrease because, due to small grinding allowance, the grinding wheel wears down more slowly and needs to be dressed less often. For this purpose, the VLC 200 GT also has a separate diamond-coated dressing roll. To ensure high machining quality, the integrated measuring pin is used to check the diameter and length of the component in the course of the clamping operation. The developers also gave special attention to large doors. They facilitate access to the machining area. “We are very optimistic that this approach will establish itself in the market”, says Dr. Guido Hegener, managing director of EMAG Maschinenfabrik. “We have already received a number of orders from OEMs and tier-1 suppliers.” – Another major benefit they will receive is the small footprint and the flexible connectivity of the VLC 200 GT for interlinking within the production area. “In each case, we guarantee the manufacturers of gearwheels a made-to-measure solution combined with excellent value for money”, concludes Hegener.